Interesting story today on the BBC website about the sale, on Ebay, of a Victorian brewery chimney once belonging to a Wrexham brewery company. Wrexham was known as a 'lager town' dues to it's good supply of mineral rich water, in the 1860s it was home to 19 collieries. 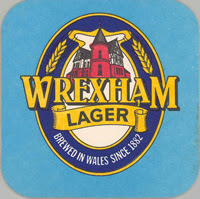 The most famous was the Wrexham Lager Company, registered in 1881, which exported lager around the world. Allegedly, a stock of Wrexham Lager Bottles were found as far away as Khartoum in the Sudan, discovered in General Gordon's palace. The records of Wrexham Lager Company were catalogued as part of the Powering the World project and are available to the public at Wrexham Archives. Highlights include brewing books and promotional material. For more detailed information on the contents of the collection see an earlier post here by Robert Evans who worked on the collection.